This heavy duty punch features durable all-metal construction that will last a lifetime. The high quality, sharp cutting punch head makes clean, ¼" holes. Totally adjustable for diverse punching applications, it also features a lever handle, a removable chip pan, and four non-skid rubber feet. Up to 32 sheets of 20 lb letter or legal size paper can be punched at one time. 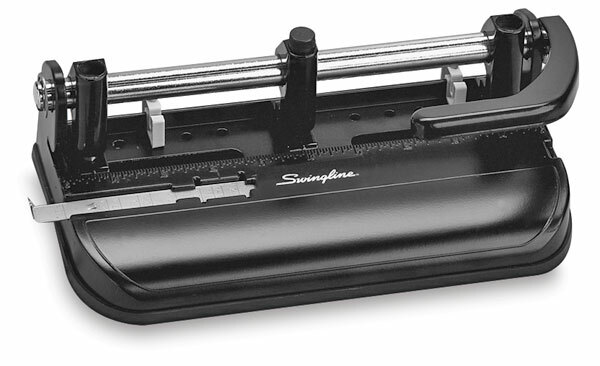 Because of its adjustability, the Swingline Heavy Duty Punch is a great value — no need to buy several punches. The center punch head has an on/off knob. Simply turn the knob to the "off" position to remove the center punch from use and do two-hole punching. Adjust the margin up to ½" for convenient, consistent paper placement. The paper guide adjusts for legal or letter size paper.